Prepare your fence for fall with these tips! Many homeowners wait until they see signs of rot on their fence to take action. 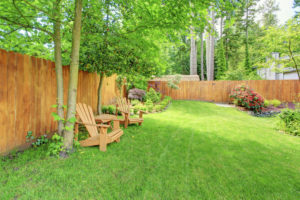 It is in your best interest to always be proactive when it comes to fence maintenance. It is a good idea to waterproof your fence to reduce the risks of rot in the future. This is not necessary if your fence is vinyl because they are water-resistant. This is the perfect time of the year to assess your fence for damage. After intense sun exposure and frequent rainfall during the summer months, a fence can show signs of weathering. Common signs of damage include loose or wobbly posts, rusted latches, and gates that do not close correctly. It is important that a fence owner understands that rotten wood will not be able to handle snow. Before the summer ends, it is a good idea to give your fence a thorough cleaning. One of the best tools you can use for this is a power washer. You could use a scrub brush, but it usually a lot of work and you won’t see as good of results. It is essential to keep the leaves in your yard off of your fence. When the leaves begin to fall, be sure to that you rake or use a leaf blower away from your fence. This is because leaves collect moisture and you do not want them to be anywhere near your fence. Wet leaves on wood fences can quickly cause mold to form. This entry was posted on Friday, August 10th, 2018 at 5:11 pm. Both comments and pings are currently closed.